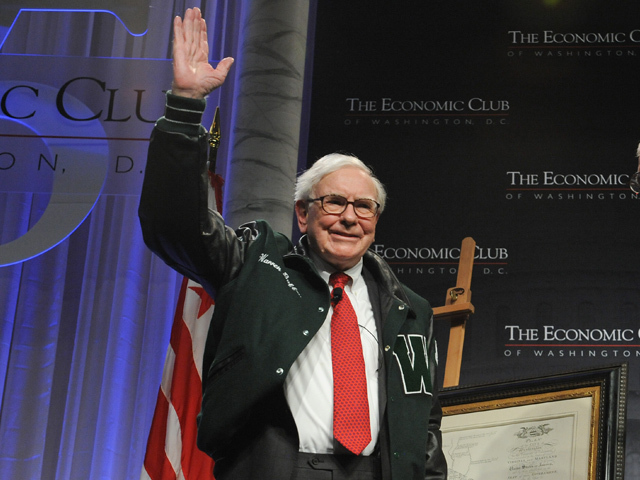 For good reason, Warren Buffett has long been considered one of the greatest investors of his generation. In fact, Berkshire Hathaway (BRK) has a higher Sharpe ratio (a measure of risk-adjusted returns) than any stock or mutual fund with a history of more than 30 years. Even after taking into account the four traditional factors (market, size, value and momentum), Berkshire has a significant alpha, or returns above an appropriate benchmark. Which leaves the question: What's the source of Buffett's alpha? From November 1976 through December 2011, Berkshire realized an average annual return of 19 percent in excess of the Treasury bill rate, significantly outperforming the general stock market's average excess return of 6.1 percent. Berkshire stock also entailed more risk, realizing a volatility of 24.9 percent, 58 percent greater than the market volatility of 15.8 percent. Berkshire's Sharpe ratio was 0.76 over the period November 1976-December 2011, nearly double the ratio of the overall stock market (0.39). That high Sharpe ratio does reflect high average returns, but it also reflects significant risk and periods of losses and significant drawdowns. For example, from July 1998 through February 2000, Berkshire lost 44 percent of its market value, while the overall stock market gained 32 percent. Not many fund managers could survive a 76 percent shortfall. However, the authors note that "Buffett's impeccable reputation and unique structure as a corporation allowed him to stay the course and rebound as the Internet bubble burst." Buffett has boosted returns through the use of leverage, estimated at about 1.6. Buffett has stuck with his strategy for a very long time period, surviving rough periods where others might have been forced into a fire sale or a career shift. Buffett buys stocks that are "safe" (have low beta and low volatility), "cheap" (value stocks with low price-to-book ratios), high-quality (stocks that are profitable, stable, growing and with high payout ratios), and are large. They also found no exposure to the momentum factor. In other words, it's Buffett's strategy that generated the alpha, not his stock selection skills. The authors adjusted Buffett's performance for what is called the Betting-Against-Beta (BAB) factor and the quality factor. The authors found that once all the factors (beta, size, value, momentum, BAB, quality and leverage) are accounted for, a large part of Buffett's performance is explained. To demonstrate this finding, the authors created a portfolio that systematically tracks a Buffett-style portfolio and found that it performs comparably to Berkshire Hathaway -- the correlation between the systematic portfolio and Berkshire's public stock portfolio is 75 percent, meaning that the systematic portfolio explains 57 percent of the variance of the public stock portfolio. It's important to note that this finding doesn't detract in any way from Buffett's performance. After all, he figured out the strategy well before the authors found his "secret sauce." As my friend and fellow author Bill Bernstein points out, being the first, or among the first, to discover a strategy that beats the market is what buys you the yachts, not copying the strategy after it's already well known and all the low-hanging fruit has been picked. However, the findings do provide us with insight into why he was so successful -- it was strategy, not stock picking. Buffett's genius thus appears to be in recognizing long ago that "these factors work, applying leverage without ever having to fire sale, and sticking to his principles," the authors write. They note that it was Buffett himself who stated in Berkshire's 1994 annual report: "Ben Graham taught me 45 years ago that in investing it is not necessary to do extraordinary things to get extraordinary results." The authors also considered "whether Buffett's skill is due to his ability to buy the right stocks versus his ability as a CEO." To address this, they decomposed Berkshire's returns into a part due to investments in publicly traded stocks and another part due to private companies run within Berkshire. The idea is that the return of the public stocks is mainly driven by Buffett's stock selection skill, whereas the private companies could also have a larger element of management skill. They found that the public companies performed better. So it's not his skill as a manager that's responsible for his alpha. However, they did find that the companies Berkshire owns provide a steady source of financing at a very low cost, allowing him to leverage his stock selection ability -- 36 percent of Buffett's liabilities consist of insurance float with an average cost below the Treasury-bill rate. Another advantage, though a less important one, is that: "Berkshire also appears to finance part of its capital expenditure using tax deductions for accelerated depreciation of property, plant and equipment." Accelerated depreciation acts just like an interest-free loan. While the Berkshire's leverage helps, it only would boost the market's excess return of 6.1 percent to about 10 percent. However, once the authors accounted for all the style factors, the alpha of Berkshire's public stock portfolio drops to a statistically insignificant annualized 0.1 percent. In other words, these factors almost completely explain the performance of Buffett's public portfolio. The bottom line is that we now know that Buffett's secret sauce is that he buys safe, high-quality, value stocks and applies low-cost leverage. Finally, I would add that while you don't have access to the type of low-cost leverage to which Buffett has access, you can access the other factors that created his alpha. For example, Dimensional Fund Advisors, Bridgeway and AQR Capital are three providers of mutual funds that use strategies that involve a systematic and highly disciplined approach to capturing or harvesting a particular return or style premium. While not index funds, their funds do fall under the broader category of what I would consider to be relatively low-cost, passively managed funds.